VERSATILE DESIGN: Infuse your room with botanical beauty with this reversible set, which features two sides of stunning leafy branches for one great value. Complete LOOK: Set includes a comforter, shams, flat sheet, fitted sheet, pillowcases, and a bedskirt for an effortlessly elegant bed transformation. SUPER SOFT: Made of cozy, durable microfiber you'll want to cuddle up to every night. LUXURY FOR LESS: Unique, stylish decor at affordable prices. You'll feel like you spoiled yourself with the "expensive" brand. Take a step back and enjoy the nature with an intricate scenic print all over the comforter. Blue & Chocolate Leaf Eight-Piece Bed-In-A-Bag 8-pc comforter set is just the thing to put some fun into shopping for bedding. When you see all the accessories that go with this beautiful collection, you won't know when to quit – nor will you want to. From the extra-large reversible comforter that is the star of this collection right down to the decorative pillows and bed skirt, the Blue & Chocolate Leaf Eight-Piece Bed-In-A-Bag has it all. 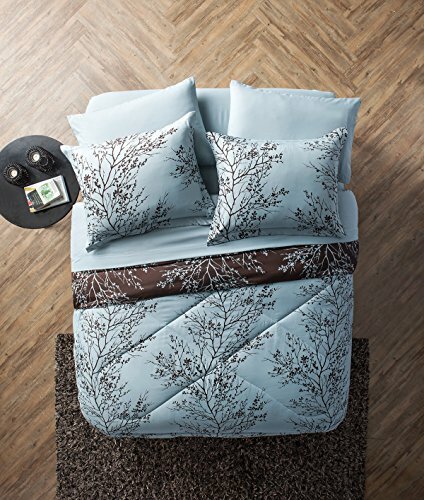 Blue & Chocolate Leaf Eight-Piece Bed-In-A-Bag 8-pc comforter set features the two colors that have always been used to represent elegance and luxury: blue and chocolate. Never before have you seen these two colors create such a masterpiece as what you'll find in this bedding set. Adorning this 2-toned comforter is a luxurious leafy pattern. The delicate stems and leafs are the exact amount to add just the right touch without being overwhelming.